Nobody expected Johnny Depp to send those photos, though in retrospect they probably should have. Director David Yates was finishing filming Fantastic Beasts and Where to Find Them when the images arrived in his email. Depp had yet to shoot his climactic scene; Magizoologist hero Newt Scamander (Eddie Redmayne) reveals that the fugitive dark wizard Gellert Grindelwald has been hiding in plain sight the entire film, disguised as dapper auror Percival Graves (played by Colin Farrell). The Farell-to-Depp switcheroo was to be the film’s biggest shock when it came out in theaters, but first it was the director’s turn to be surprised. When Depp’s Grindelwald was unveiled in the final moments of Fantastic Beasts, fans were indeed stunned, but also concerned. The dark wizard looked so strange. Was he supposed to be comedic? So for the second title in the planned five-film franchise, The Crimes of Grindelwald, the evil wizard’s appearance was “softened and refined”, made to look more natural. Judging by the enthusiastic fan reactions to the film’s final trailer at the end of September, the tweaks worked. Grindelwald’s evolution was just a small example of how the Fantastic Beasts team leveled for the sequel. Where to Find Them bore the burden of launching a new Wizarding World franchise with a different cast, setting, time period, and characters. While the movie was largely a success – with solid reviews and $814 million worldwide at the box office – members of the filmmaking team quietly felt that the sequel could (and should) be an improvement over its predecessor. That elevation began with Rowling’s script, which largely shifts the action from New York to Paris – a new locale, sure, but returning to Europe feels more Potter-esque. And while the first film was focused heavily on Newt, the sequel is more of an ensemble piece that deepened returning characters, introduces several new ones, and plays like a life-and-death, wartime noir thriller (no whimsical three minute scenes of Newt demonstrating a mating dance at the zoo with a horny Erumpent). The setup is that Grindelwald escapes while being transported to a new prison and rallies an army of supporters with his pledge to unify the Wizarding World and rule Muggles. That leaves Hogwarts professor Dumbledore (Jude Law), the dark wizard’s childhood friend (and perhaps more? ), to enlist his expelled former student Newt and, by extension, his American friends – rebellious auror Tina (Katherine Waterston), her telepathic sister Queenie (Alison Sudol), and affable No-Maj Jacob (Dan Fogler). But that’s only the beginning. Ah, yes. From the moment that first photo was released of Law as a dashing 45 year old Dumbledore, even the most discriminating Potter purists admitted he was spot-on as the beloved wizard (and some rather hot for teacher, with hashtags circulating like #DumbleDaddy and #DumbleDamn). Adding Dumbledore to this prequel pleased Rowling, too, who spent more time visiting the set during this shoot than the first film. Newt’s whip-smart auror love interest Tina is back as well, going on an unauthorised (naturally) mission to hunt down Credence in Paris. “She’s more confident this time. No one is questioning her intellect and instincts,” Waterston, 38, says. Yet her character’s love life is a mess thanks to some long-distance-relationship misunderstandings. While fans know Newt and Tina eventually end up together, the duo clearly have no idea. “It’s fun to play something out where the audience is one step ahead and Newt and Tina are the clueless ones,” the actress says. 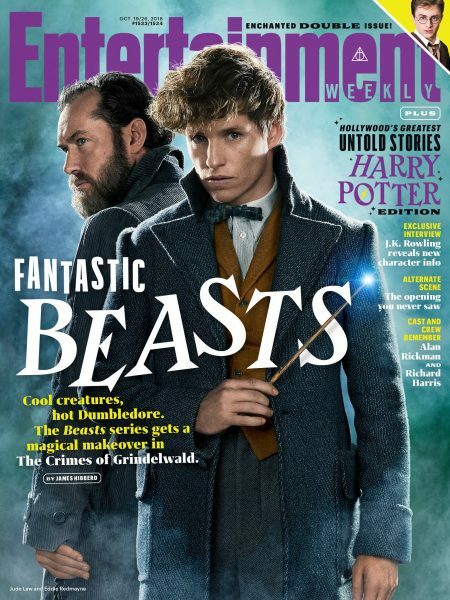 Newt also has a tense relationship with his older brother, Theseus, played by Callum Turner, who broke his wand during his first day on set during an enthusiastic screen test. Theseus is an uptight careerist and Head of the British Ministry of Magic’s Auror Office, who’s pressuring the rebellious Newt to fall in line with the wizarding government’s plans. “Theseus wants his brother to stand up and fight [Grindelwald],” says Turner, but the two have conflicting ideas on how to #resist. That Theseus is engaged to Leta Lestrange (Zoe Kravitz) – Newt’s schoolboy crush – complicates matters as well. Once on set, Kim worked with a contortionist to perfect her act, infusing her performance with varying degrees of snake-ness. “David would give directions like ‘Can you do 2 percent more snake?’” she says, laughing. The Wizarding World’s notorious outlaw Gellert Grindelwald was briefly revealed two years ago in Fantastic Beasts and Where to Find Them, and his name is right there in the title of its new sequel, The Crimes of Grindelwald. Yet actor Johnny Depp, 55, remained silent about his crucial character 0 until now. Below, Depp lends insight into the mysterious villain his castmates say is the movie’s most unexpected revelation. Were you a Harry Potter fan at all before all this? I read the books when my kids were smaller and watched the films with them. The books were superb. What J.K. [Rowling] delivered is really a difficult thing to do as a writer – to create a whole new universe and a set of rules. And you pick it up in one fell swoop in the first book and first film. It’s a whole lot of information and I was amazed – you never felt like you were being slathered with exposition or being condescended to. It’s good literature and great writing in its own right. It ticks all the boxes. And I had a lot friends in the film, like Robbie Coltrane (Hagrid) is a great friend. Richard Griffiths (Vernon Dursley) was a great friend, rest his soul. So I was pretty familiar with them and hugely impressed. It does, and then it doesn’t. As Grindelwald [was pretending to be] Graves, his responsibility is to portray Graves. I suppose the more contemplative moments of Colin’s – the more silent moments -for me, that’s when I would see bits of Grindelwald. You get one brief introduction to Grindelwald in the first one. There were a number of things in the second film we got to plug in and utilize that gives you more of an insight into Grindelwald and that’s all due to J.K.’s approach to the character. Sometimes things arrive and for me in the moment and its always important to pay attention to whatever that is, when you have a certain instinct about something. I always follow it. She and David were great in terms of allowing me to step outside of the screenplay and dialogue as written and travel a bit more and try things. Something happening by chance. To me, that’s always the most satisfying – mistakes or accidents. Unlike Voldemort, who ruled by fear and force, I’ve heard Grindelwald is charming and manipulates people to get what he wants. Yeah, exactly. He psychologically motivates people to his ends. I think he’s just waiting. He’s looking forward to [their inevitable showdown]. I think there’s probably a lot of residue left over from days gone by. They quite bonded, you know? When you loved someone, and cared for someone, and it arrives into a [combative] arena – as it has with Dumbledore and Grindelwald – it’s very dangerous when it becomes personal. I think it should be left up to the audience to feel it first, and when the time comes … It makes the situation with Dum­bledore all the more intense. I think there’s a jealousy with Scamander. He sees Scamander as Dumbledore’s protégé – his boy, in a way. That in itself is enough for Grindelwald to want to take Scamander down in a way that is ferocious and eternal. Heading into Fantastic Beasts: The Crimes of Grindelwald, what do we need to know about the title character? The first mention of Grindelwald is in Harry Potter and the Philosopher’s Stone, so he has been part of the canon from the beginning. He was a very famous dark wizard whom Dumbledore defeated in 1945, a wizard who once owned the Elder Wand (as Voldemort did later). Although he remained rather mysterious in the Potter books, I had a very clear understanding of who Grindelwald was and what his story had been. Grindelwald is essential to an understanding of how Dumbledore became Dumbledore. What has it been like writing dialogue for a younger version of Dumbledore? It is no secret that Dumbledore is my favorite character in the Potter stories, so it was an absolute joy to have an opportunity to write dialogue for him again. He’s a fascinating character on so many levels. How much of the three planned upcoming Beasts films do you have mapped out? As with the Harry Potter books, it is all mapped out. In fact, when we announced the five films, I talked about that. It’s always possible that some details will change along the way, but the arc of the story is there. It’s been an amazing opportunity to tell parts of the backstory that never made it into the original books. I’m thinking particularly of one character that I think fans will be surprised to meet in this movie. We’ve been told each Beasts film is set in a different city. Can you reveal one of the cities from one of the future movies? It’s far too early to spoil anything. What I can say is that we’ll go to at least one new city in the next film, possibly two, and I’m keen to move outside Europe and North America. But you’ll just have to wait and see. Yusuf Kama, played by William Nadylam, is a French-African wizard who claims to be the last male of his pure-blood family line, so his official character description tells us. Although we’ve not seen much of this particular character from the trailers, we do know a few things about him – such as how he is on the hunt for another character we know a little better: Credence (Ezra Miller). And, for the first time, we can reveal that Yusuf has actually taken an Unbreakable Vow to track Credence down – a magical promise meaning that if he doesn’t fulfill his task, he will die. We saw Severus Snape make one of those vows during Harry Potter and the Half-Blood Prince, promising to assist Draco Malfoy in Albus Dumbledore’s murder. So, as you can see, Unbreakable Vows are usually reserved for quite serious things, rather than, say promising to make someone a cup of tea. Yusuf also has a connection to Leta Lestrange (Zoe Kravitz) in the new film: he’s actually her half-brother. How? Well, again, according to his biography, Yusuf’s mother was “taken” by an evil wizard called Corvus Lestrange, and ended up having a child with him – Leta. But why the obsession with Credence? From the first film, Credence is only known to us as an orphan – so is it possible Yusuf needs to track him down due to a family connection? Prop modeler Pierre Bohanna captured Newt’s brother’s sturdy “statesman” demeanor in this wand, down to the quartzite stone handle. It’s made of “tough, robust materials,” amounting to a “very strong, powerful wand”. For Queenie, the design team was able to have some fun. “It gave us a great opportunity to create a fashionable wand,” Bohanna says. The result, with a mother-of-pearl handle, is quite striking. The Grindelwald ally sports a simple design. “Wands are very personal items, almost like pieces of jewelry,” Bohanna explains of how he conceives them. He used this simple design to introduce viewers to Rosier. Bohanna has some theories as to the horn on this wand’s edge: “You can heat a horn and reshape it; you’ll see it’s had some work done to it in that way.” Also, given Flamel’s age, bet it carries serious magical properties. Bohanna says this sleek mix of ebony and silver reflects growth. “She made some aesthetic choices as she matured,” he explains. “The wand that you has as a kid isn’t necessarily the wand you want when you’re older. This wand was conceived for Prisoner of Azkaban, when its power wasn’t yet clear. “!The Deathly Hallows book wasn’t yet released,” Bohanna says. “We had no idea of what it’d come to mean.” Still, his design was just right.